Advances in technology fueled by innovation were explosive in the early 1990s. Manufacturing technology was in stride with other major advancements – from the introduction of primitive CAD systems, clunky robotics and basic 3-D printing to the rise of AI and Industry 4.0 that today drives more efficient manufacturing, new business intelligence and highly sophisticated smart factories. However, the biggest innovation within the fabricating industry was the introduction of the fiber laser for industrial applications. Fiber lasers have revolutionized the way manufacturers process materials. They’re fast, reliable and able to efficiently cut and weld normally difficult materials, such as those that are highly reflective, dissimilar or very thick or thin. As a result, manufacturers and fabricators benefit from the high quality and lower production costs in everyday items, such as consumer electronics and electric vehicles that would otherwise be cost prohibitive to attain. To better understand how fiber lasers rose to their prominent position in materials processing, look back to 1990 when Valentin Gapontsev and Igor Samartsev first proposed the use of fiber laser technology to produce high-power lasers. Despite their detractors, the two physicists successfully created the first high-power infrared (IR) fiber laser with single-mode beam quality. The high power was enabled by a side-pumping technique developed exclusively by Gapontsev and Samartsev, which allowed the light from multiple pump diodes to be efficiently coupled into the cladding of an active gain fiber. Later that year, Gapontsev officially founded IPG Photonics, which would soon become the recognized leader and innovator of fiber laser technology. 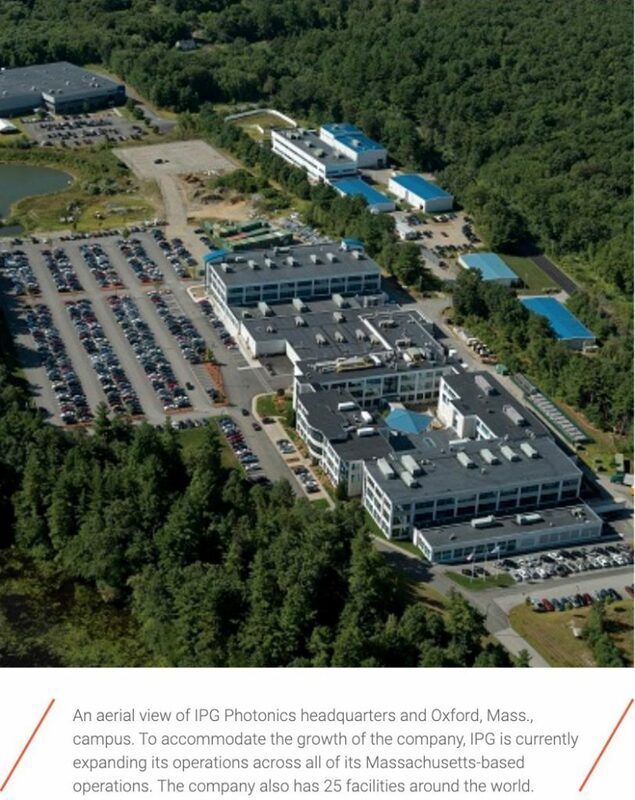 Today, IPG is a publically traded company headquartered in Oxford, Mass., with more than 5,000 employees and 25 facilities around the world. Prior to Gapontsev, fiber lasers were never considered for materials processing – they were viewed as something unable to generate more than a few hundred milliwatts of power. Early on, fiber lasers were solely for data transmission and even then, the distance they’d be able to transmit wasn’t clear. But Gapontsev saw potential in the fiber laser and can be credited with the technology’s proliferation and its eventual use in manufacturing processes all around the world. In 2006, IPG launched the first commercially available 3-kW fiber laser. At that time, CO2 lasers were the manufacturing industry’s cutting technology of choice, but due to fiber’s ability to process a wider range of materials faster and more efficiently, the new lasers quickly overtook the market. 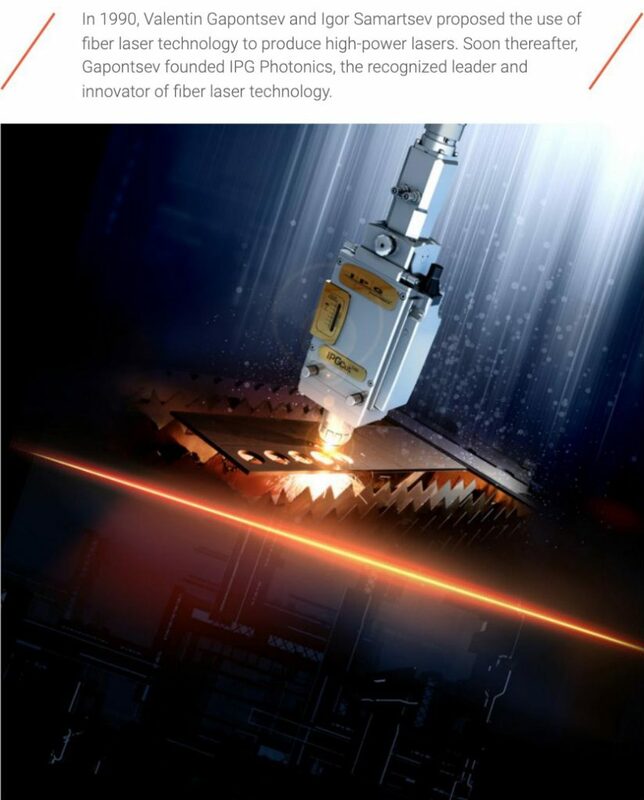 To keep up with the rapid adoption of fiber lasers, Gapontsev led the vertical integration and global expansion of IPG facilities to control the entire supply chain and ensure the production of high-quality, reliable products for its customers. In addition to fiber lasers, IPG produces its own diodes, diode packages, fiber amplifiers and complete laser systems as well as a range of laser accessories, such as optics, beam switches and chillers. Under Gapontsev’s direction, IPG has continued to revolutionize fiber laser technology, including the development of products that are more than 50 percent energy efficient, which translates to significant cost savings for customers. IPG innovations are driving down the cost per watt of its lasers while simultaneously shrinking the overall laser footprint. New products and solutions are also frequently being added to the company’s comprehensive offerings. Three new innovations include a quasi-continuous wave (QCW) mode for continuous wave (CW) lasers, a new adjustable mode beam system and a laser depth weld monitoring solution. IPG’s introduction of new QCW mode for CW lasers provides a peak laser power up to two times average power, allowing for increases in piercing speed, improvements in pierce quality and the ability to pierce thicker materials while maintaining the throughput benefits of CW lasers during cutting. The high peak power allows for reduced heat input in the QCW mode resulting in higher quality cuts of intricate parts with fine features and enhanced drilling capabilities by allowing clean, controlled drilling in thicker materials. 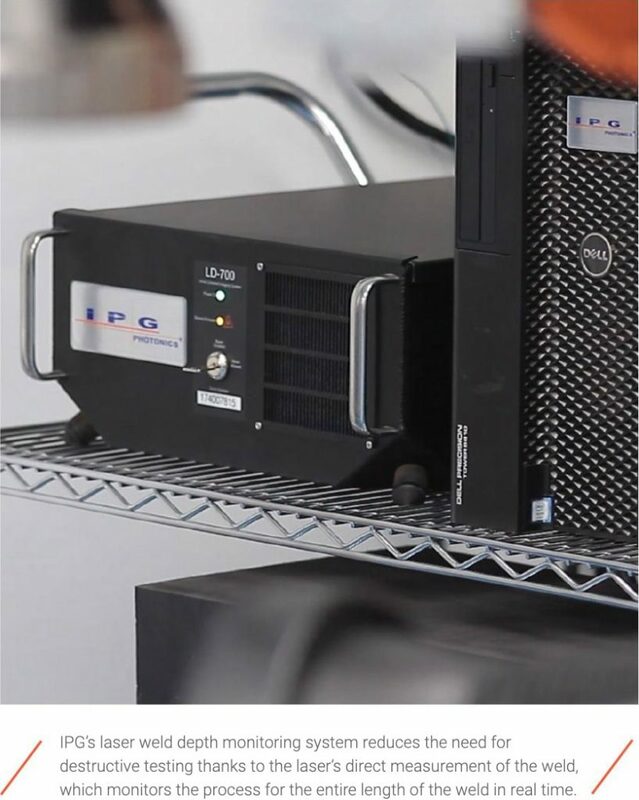 This unique capability is made possible by IPG’s QCW diode designs, which have the ability to provide very high peak power for short duty cycles, with a real-time capability of switching to CW mode. 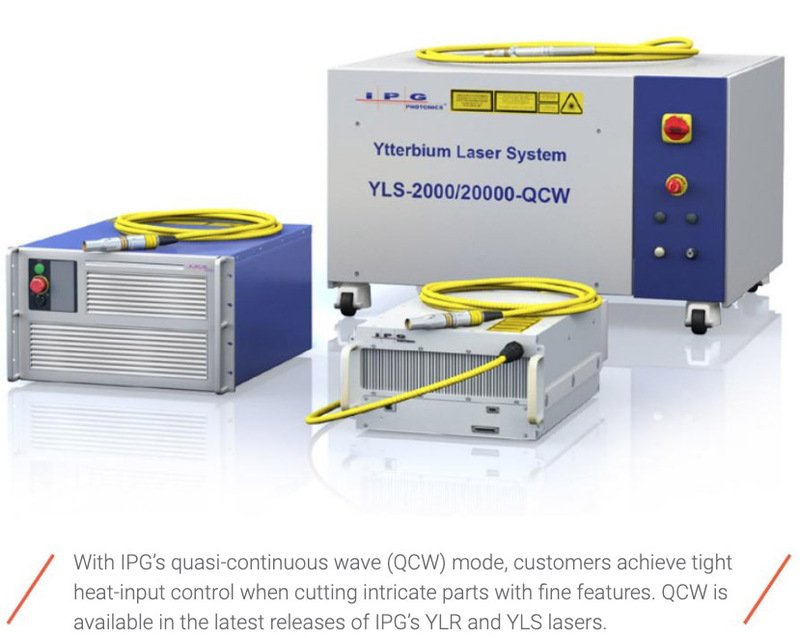 Available exclusively from IPG in the latest releases of YLR and YLS lasers, the QCW mode provides improved cutting and drilling quality and increased overall throughput – all while saving material, time and operating costs. “The rollout of QCW technology in our CW lasers is a good example of IPG solving problems experienced on the shop floor through an advanced laser technology that decreases cost of ownership while increasing overall productivity” Ness explains. Unlike a traditional fiber laser that uses a single output beam for laser delivery, the IPG AMB solution allows customers to change output beam mode on the fly and increase flexibility in a range of applications. The beam mode can be adjusted from a high-intensity central spot to a larger ring-shaped beam or series of rings. The technology has uses in applications such as cutting, welding and cleaning. In cutting, the technology can be used to process a wider range of material thicknesses and improve piercing and cutting quality. In welding, it provides lower spatter and improved weld quality in certain material combinations and also offers the opportunity to use the outer ring beam to clean the material prior to welding. IPG recently launched their newest innovation, the LDD-700, a multifactor, in-process weld measurement tool. The LDD-700 improves welding operations by measuring the quality and consistency of the welding process, which reduces the need for destructive testing of the products. This provides a level of consistency and accuracy and a depth monitoring capability not seen in traditional weld monitoring systems that can simplify quality control and drastically reduce rework. The LDD-700 utilizes a low-power IR laser beam through the same beam delivery system as the welding laser to measure the surface of the material before, during and after the welding process, usually with a single presentation of the part. The IR laser beam light is reflected back to the welding head and then into the imaging system where the depth of the keyhole is accurately determined; it also confirms that the beam has struck the correct location of the part with results so accurate that it is comparable to destructive testing. Because the monitoring is happening at the head, as opposed to separate cameras mounted near the welding operation, manufacturers don’t need to worry if the sensors have been accidentally moved out of position. The integrated design also allows for accurate weld monitoring in tight spaces. Webster offers the example of a customer that has multiple high-tolerance machined subassemblies that must be welded together at various stages throughout the manufacturing process. Catching errors early in the welding process helps manufacturers avoid costly scrapped parts. The LDD system is ideal for industries such as medical, aerospace and automotive where many products are safety critical. The LDD system is well-suited anywhere that welding quality significantly impacts the overall quality of the end product. 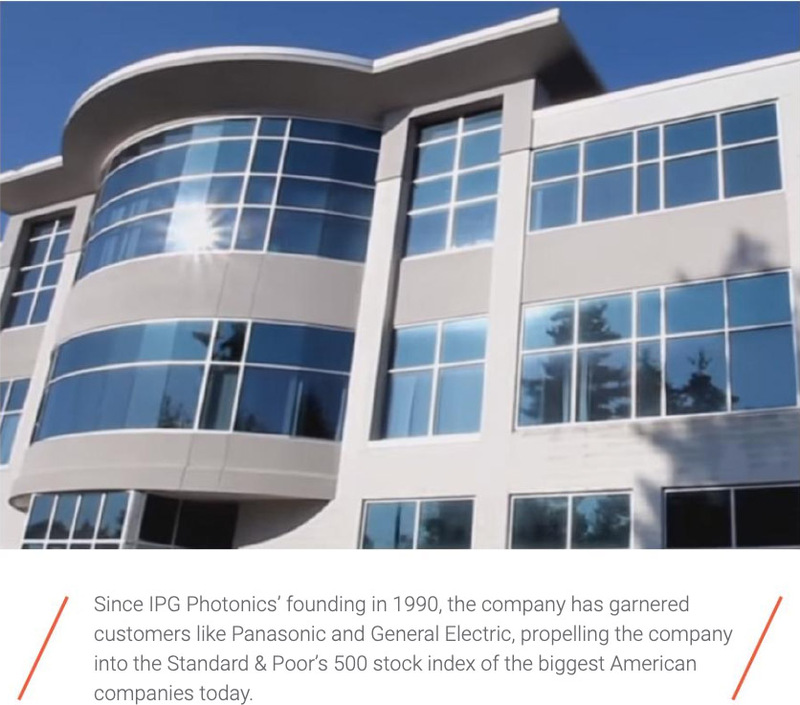 In today’s fast-paced world where everything is constantly changing, IPG Photonics is poised to exceed the standard pace of innovation. The company achieves that pace through continuous innovation and development of the highest quality possible, delivering the most reliable fiber laser solutions for today’s needs as well as tomorrow’s. “These three new innovations are brilliant examples of Dr. Gapontsev’s ongoing global mission of making fiber lasers the technology of choice for mass production,” Ness says. “The LDD-700, adjustable mode beam systems and the new QCW mode demonstrate IPG’s commitment to decreasing our customers’ cost of ownership while improving their overall productivity.